On a recent summer morning, Urmila Yadav set off for the main temple in the village of Budhpura, located in India’s north-western state of Rajasthan, where a community meeting was taking place. She hesitated as she entered the courtyard filled with women of different ages. All of their husbands had died while working in the mines as they succumbed to silicosis, an incurable lung disease. Silicosis, caused by inhaling the silica dust in gold-bearing rocks, can lead to breathing difficulties, regular coughing and chest pains, and it can also lead to tuberculosis. The widows had decided to stage a protest in the main town of Bundi, where the state’s chief minister, Vasundhara Raje, was visiting. As Urmila entered, the widows were preparing slogans and banners demanding pensions and compensation. “There she is. Come, come,” a few women cried out. Feeling a little overwhelmed by the crowd, the 19-year-old smiled shyly and sat on the ground. As those around her shared their stories of despair, she kept her head down and nervously started to fold and tuck her long scarf. 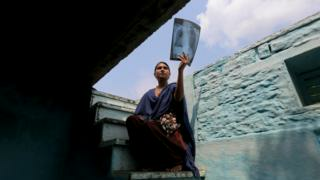 Two years ago, at the age of 17, Urmila became one of the youngest certified cases of silicosis in India. Her case is singular, even in this village where mining and quarry work is the only occupation and silicosis is a commonplace disease that strikes almost every family, it is mostly men who are affected. Rajasthan, which has the highest number of mining leases, has been the epicentre of silicosis in India. The number of silicosis certified patients in Rajasthan, according to government data, is 8441 (the figures are available up to April 2017). Actual numbers are likely to be much higher, claim advocacy groups. It is the only state to have a monetary relief mechanism for certified patients, in place since 2013, but the onus is on workers to get a diagnosis and prove their occupational history, which is challenging in an unregulated industry like mining in India. More men than women are vulnerable to the disease, because of higher exposure over a period of time. The National Human Rights Commission of India calculates the average age of onset of silicosis at 27 years. For a young teenage girl like Urmila to have silicosis is “quite an unusual case”, says Dr Vinod Jangid, member of the pneumoconiosis board, which is responsible for diagnosing silicosis at the medical college in Kota, a district neighbouring Bundi. It may be rare, but not as improbable as it appears, says Pekham Basu, an independent researcher on occupational disease among mine workers of Rajasthan. She suspects there could be more children with silicosis but the government will hesitate to certify young people. Urmila began to work in the stone quarries next to the village in her childhood. It is common here for men to work in mines and for women and children to supplement the family earnings by carving cobblestones by hand, chipping away with a hammer and chisel. Two years of this work and she began to fall ill.
“I could not work for very long, I was too weak,” she says. No matter how many times she went to the doctor, she would not be rid of the fever, the cough, and the constant shortness of breath. The doctors suspected a case of tuberculosis, but after six months of treatment, she had not recovered. 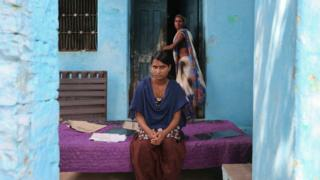 Her mother, Hemlata, is 40, but she looks weighed down by age. “I had to mortgage our house to pay for her treatment. I still owe money to the lenders,” she said. In 2015, Urmila received 1,00,000 rupees ($1,535, £1,160) as compensation that the Rajasthan government gives to silicosis-affected patients. Her family used the money to settle the mortgage against their house. Hemlata works long hours in a mine close by, her husband does not contribute to the family income. After seeing her daughter suffer, she wants to protect her younger son Rohit from working in mines and being exposed to dust. That has not been possible as there is no other work. So, she lets him work intermittently. Later in the morning, as the women piled into vans for the protest, Urmila remained at home. She did not have the strength to go out for a full day. Her mother decided to join the protest. “Though we have received compensation, we’re all in this together and I have to support other women,” Hemlata said. Before she found out she had silicosis, Urmila had never heard of it. She knew that the dust was not good for her, so she would cover her face with a scarf when she carved stones, which is little protection against fine silica particles. She brings out her X-rays and medical certificates, stored in her room. She is not aware of the fatal consequences of silicosis, that it is not a treatable disease. She thinks she has been cured. Her health is stable now, except for bouts of exhaustion and weakness, and a lingering cough that never leaves her. Some time ago, she took up sewing classes at the local non-governmental organisation (NGO) in the village. It gives her the chance to go out and spend time with young girls of her age. Most of them work in quarries and head back there after classes. “There are many girls in Budhpura who do this work. Some are 15 or 16 years, and some even younger. I wish they can be saved from this work,” she says. With additional reporting by Petra Sorge and Julia Wadhawan. The reporting has been supported by the European Journalism Centre and funded by the Bill & Melinda Gates Foundation.